One thing I want to do in the New Year is to really develop my family recipes. I would love to have just a few that we all love and make time and time again. 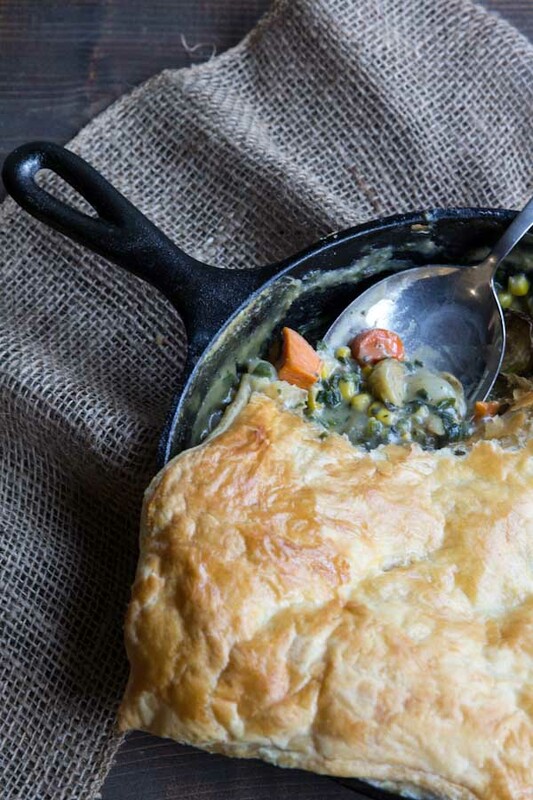 This Chicken and Vegetable Pot Pie is definitely on the list. I have made it a handful of times already and it’s one that everyone enjoys. 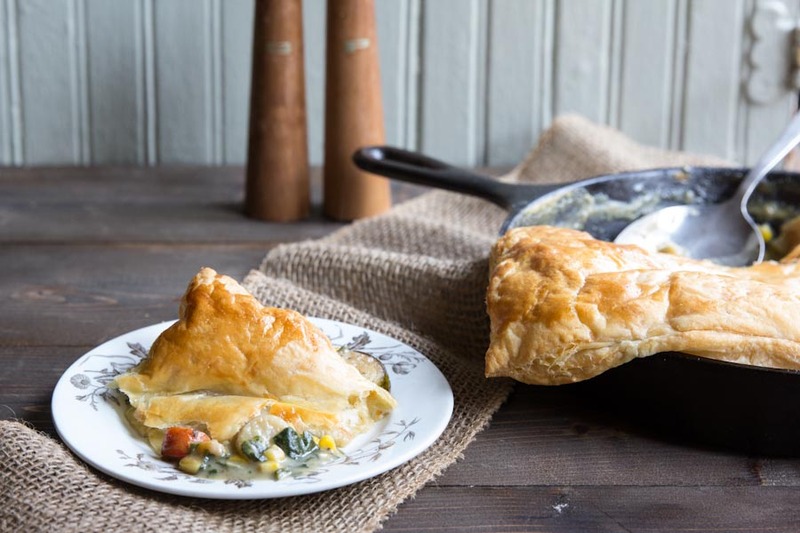 The recipe is pretty simple , using the same skillet to cook the vegetables then bake with the puff pastry on top (you don’t have to make pie crust for this pot pie!). It can be easily adapted with whatever ingredients you have on hand. This time I made the pot pie with leftover rotissere chicken and seasonal root vegetables from Liberty Heights Fresh. 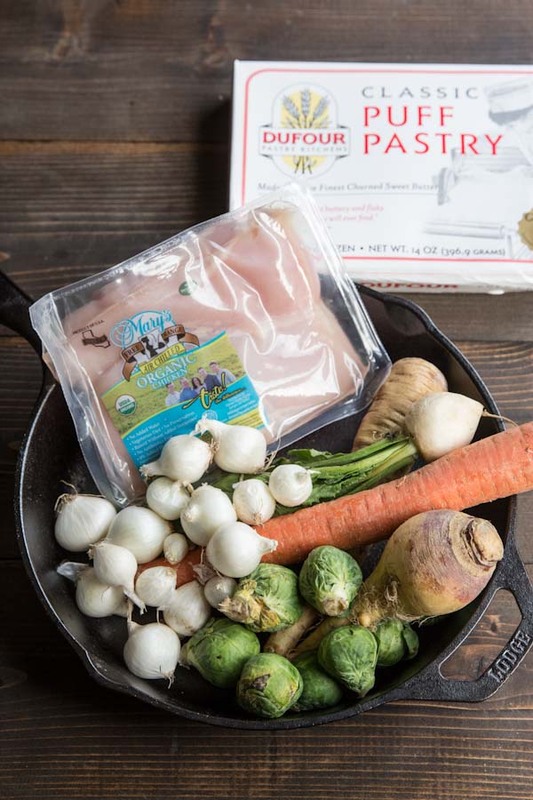 I also picked up organic Mary’s Chicken and a unprocessed puff pastry from Liberty Heights Fresh (Dufour is a good brand if you can find it! The ingredients are all simple ingredients you’ve heard of). 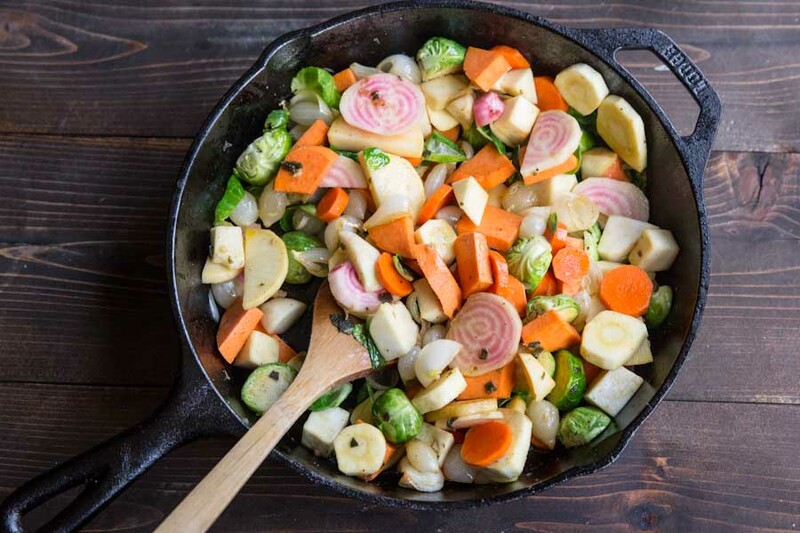 Whatever vegetable you use, make sure you have about 2-3 cups and cook them in batches, cooking the harder vegetables a bit longer in the skillet. For leafy greens like kale or spinach, use one bunch for 1 cup of the vegetables, and add them in with the other vegetables toward the end of cooking. One thing about being a food photographer in the winter season (and other food bloggers will commiserate with me) is that it gets dark way too early to photograph dinner. I tried one evening and it was too dark. Josh tried to help by holding up a light while I photographed (picture below) but, as you can tell, the color is just not the same as natural lighting. What are your family favorite recipes?! 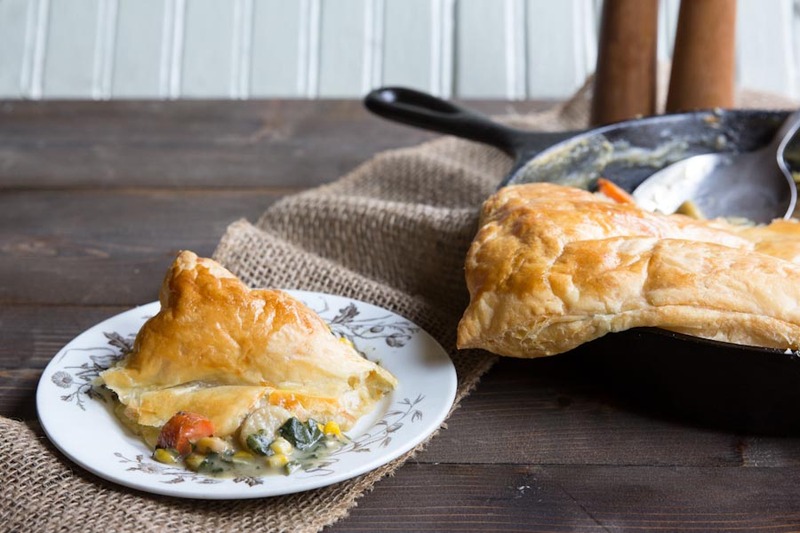 An easy Chicken and Vegetable Pot Pie Recipe using puff pastry and one skillet. Sprinkle flour over, and stir well to combine. Stir in broth, 1/2-cupful at a time, then add milk. 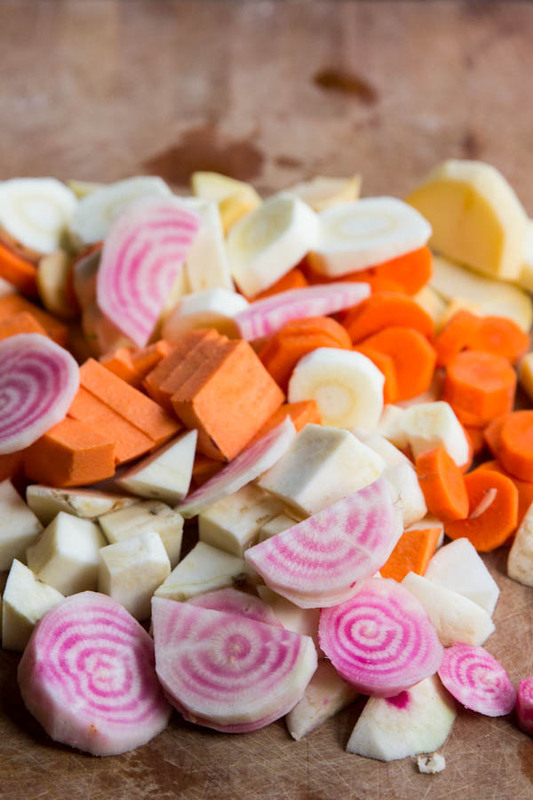 Bring to a boil, reduce heat, and simmer until vegetables are softened and broth is thickened, 8-10 minutes. Add chicken to skillet, stir, and season with salt and pepper. Unfold puff pastry and smooth any creases using a rolling pin; place over skillet, allowing corners to hang over sides. Whisk egg and 1 teaspoon water in a small bowl. Brush pastry with egg wash; cut four 1-inch slits in top to vent. Use whatever vegetables you have on hand. If you're using greens, use one bunch for 1 cup of the vegetables in the recipe. Love the rustic look of this. Brussels Sprouts are now being added to my pot pie forever and always! Thanks for your ease and honesty! One of our family favorite dinners is a panko crusted chicken with a maple dijon pan sauce! My husband requests it at least once a week!! And like your pot pie it’s so easy, because you only use one pan for everything!! Your maple dijon sounds amazing!! Do you have that recipe posted Holly??! 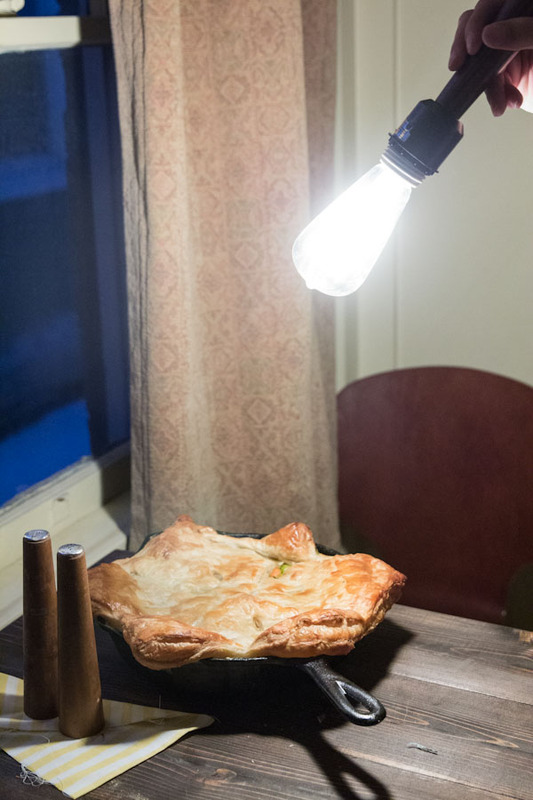 I really like the way you do your pot pie! I would have never thought to add beets! Figuring out our family recipes is a goal of mine, too. It’s hard cause we’re always making and trying new dishes. If I had to pick right now, probably anything with pesto, fried rice or my chunky carrot and eggplant marinara sauce. Fried Rice is a perfect family favorite!! I’ll have to make that soon too. Is your recipe on your blog?! I love the giant sheet of puff pastry covering your pot pie. It looks beautiful! It is so hard trying to photograph dinners. I am usually cooking dinner in the early afternoon in order to capture enough sunlight. The things we do! So realting to the natural light thing. Our place doesn’t even get much natural light in the summer, so winter is the pits in photography land…. 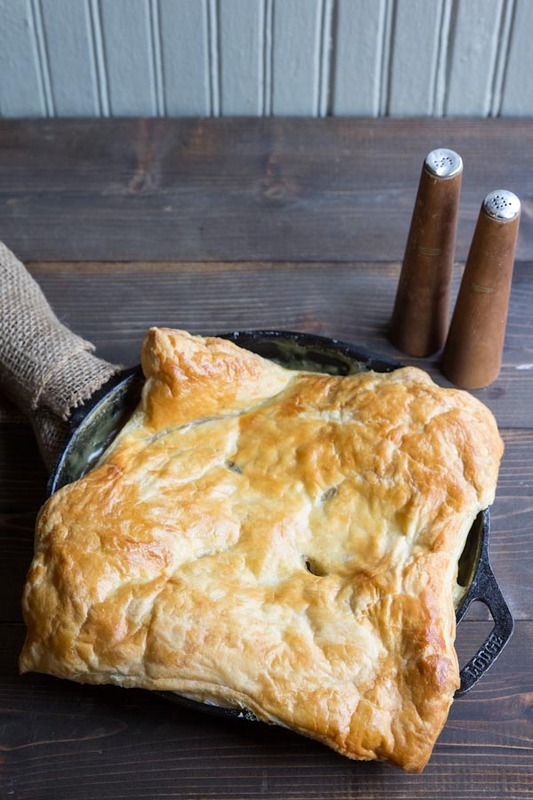 I never made chicken pot pie in my life -because of the bottom and top crust — which I had no confidence to make.. 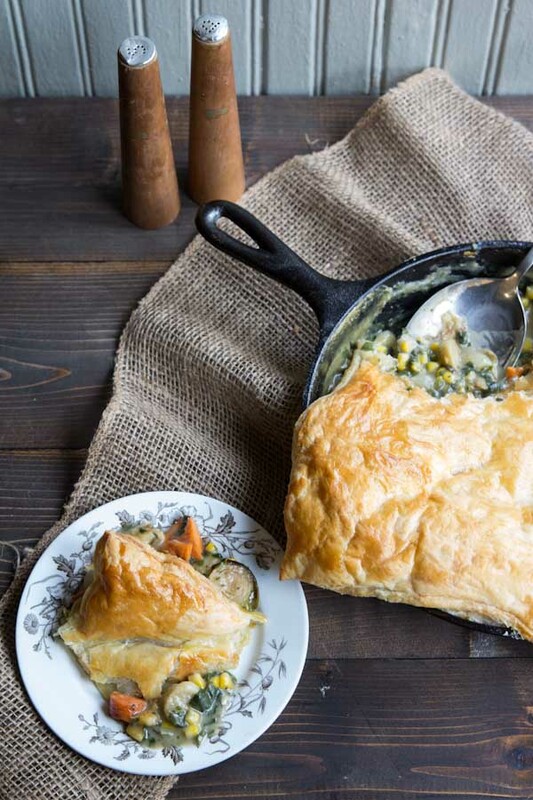 This recipe was absolutely delicious and the puff pastry top was not heavy — just perfection.. The only fresh veggies I used were mushrooms, garlic, and a parsnip (and fresh sage) I thawed 1/2 bag of green peas and carrot combination, 1/2 bag of pearl onions, and 1/2 bag of chopped collard greens with turnip… I made mine on the stove top just as directed – pouring the finished veggies and chicken into a shallow casserole and put the dough on top… I was fabulous.!! That’s so great to hear Jean! Thanks for reporting back and your veggie combo sounds delicious!